In spite of the political unrest in Mali in 2012, Build a School in Africa was able to build its 10th school, in the small village of Kounfouna. My annual trip, which had been postponed until January 2013, had to be canceled because French and Pan-African troops went into northern Mali just 2 days before my flight, and there were State Department warnings about travel to Mali. However, the funds had already been wired to Sikasso, and we were able to go ahead with the Kounfouna project, with construction starting in February 2013 and finished by early May. 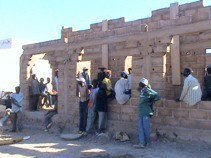 Politically, things have stabilized in most of Mali. There have been occasional skirmishes in the north around Kidal and Timbuctou, but they have been quickly put down by French and Malian troops. The presidential election took place in July, with Ibrahim Boubacar Keita winning a decisive victory in a peaceful election, and Parliamentary elections also took place peacefully on December 1. Since I had been unable to visit Kounfouna in 2012 , we visited the new school early in November to see it in operation. The village put on a huge celebration, with music and dancing and lots of speeches. This tiny village had not had ANY school until 2012; miles (over really terrible roads) from the nearest community with a school, almost none of their children had access to any education. In 2012 a first grade was started in a windowless storeroom, hardly a satisfactory learning environment, but now that they have two bright new classrooms—with hopes to add more in the future—the children of Koufouna have a much brighter future. They currently have just one teacher, who shuttles between the first and second grade classes, but the mayor has promised to hire another teacher, and has also promised to give free birth certificates to any parents who wish to enroll their children, so we expect that the number of children in school will increase dramatically. 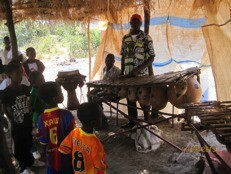 Fundraising continued during 2013 for our 11th school, sited in Kongoliko, in the Blendio commune north of Niena. They already had one cement block classroom, and Build a School in Africa is adding two more. We started construction in Kongoliko on November 12th, and the school is already almost half finished. Upon completion. that will have 3 cement block classrooms that meet government standards, as well as three of the old-style mud-brick classrooms, which have definitely seen better days, but at least they can serve grades 1 through 6. For 2014, we hope to build our 12th school since 2005; there are a number of communities on a waiting list and our partners in Mali will soon be drawing up community profiles before making a decision on where it will be. Wishing you health and happiness in 2014.